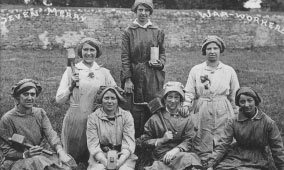 Amongst the people in South Gloucestershire during the First World War there was no shortage of enthusiasm and talent. There were many amateur theatre productions and concerts. 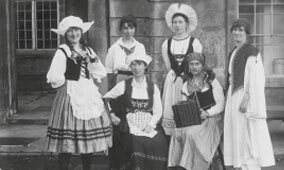 Some were used as fund raising for the war effort and some had patriotic themes. All gave much needed light relief to hard work and the worries of war. In the home, there was the singing of popular songs around the piano. In better off houses, the carpet was rolled back for dancing to the new records on a gramophone. Some families played cards, board games or read books and magazines. Newspapers had regular cartoons lampooning the war situation.